Sometimes, it's easy to get the impression that Apple Computer's iPhone (and a few iPhone users, too) has a smug attitute of superiority over the competition. (some of this comes from the fact that Apple Computer's stock market valuation surpassed rival Microsoft's for the first time ever last year, see HERE for detail on that) Still, all of this kind of reminds me of the days when Apple's Macintosh and the PC standard (based largely on Microsoft's operating system — initially DOS, followed by Windows of countless iterations) duked it out for desktop supremacy. Apple ultimately lost that battle and today, the market share for Windows computers is around 93% while it's about 5% for Mac, and the open Linux system has about 1% (but is much larger for certain types of computers, such as servers) and all others share the remaining 1%. Not everyone has (or even WANTS) an iPhone — and you can count me among them. I have an Android phone for entirely rational reasons: my monthly service is dirt cheap and I also enjoy unlimited data and calling usage that has been phased out by most other carriers. Not that I use my mobile device all that much, but I just don't like being told I have a fixed number of minutes each month. I have gone the pay-in-advance wireless route (which is slightly different than prepaid as it's understood in the U.S. today because it involves having services on an ongoing basis), where you basically buy the phone at (or near) the actual cost without a subsidy from the carrier, and you then prepay for your service each month. There is no long-term service contract, no limit on data usage, and unlimited calling, text messaging and even photos taken with my phone are included. That works for me. According to MetroPCS, one of several rapidly-growing carriers in the pay-in-advance mobile space, the prepaid customer segment has been what has propelled growth in mobile phones to 100% (or more) penetration in virtually every market on earth. As of December 31, 2010, MetroPCS had over 8.1 million subscribers and now ranks as the 5th largest mobile carrier in the U.S. The only real downside is that the company is focused primarily on serving major metro areas, but roaming prices are reasonable for those rare occasions I do need to use my mobile phone outside their coverage area, although they do NOT yet offer roaming data availability, so sometimes when I'm on the road, I can only use my phone to make calls or send text messages — kind of like we used to before smart phones, although WiFi connectivity makes that a non-issue in many places. Because of iPhone's early-to-market advantage in smart phones, there are presently some apps that remain exclusive to iPhone/iPod Touch devices, and iPhones aren't at risk of becoming "niche" mobile phone devices anytime soon. But my point is that application innovation for Android and other mobile platforms will likely outpace iPhone development in coming years. In fact, Fortune's Seth Weintraub predicted that 2011 would be the year sales of Android devices explodes, and along with it, applications. According to ABI Research's estimates, although the iPhone interface had more than 5.6 billion accumulated application downloads by the end of 2010 (thanks largely to having such a successful head start in the mobile device space), compared to nearly 7.9 billion total downloads from all stores during that year. But ABI Research is predicting that Apple is set to face much more intensive competition in 2011 in the mobile space. Adding to this trend is much more proactive involvement in app store development from other platform providers such as Google's Android, Blackberry and Windows Phone. According to the Millennial Media November 2010 Mobile Mix report, Android applications now account for 54% of all apps sales, compared to 39% for iPhone. Not everyone is crazy about the emerging duopoly of mobile platforms, and a new consortium of mobile carriers, developers and manufacturers called the Wholesale Application Community (WAC) hopes to shake things up in the smart phone apps market. Only time will tell, but more competition is always healthy from my perspective. Regardless of your feelings on the Android/iPhone battle, my point was that until recently, most of the innovation on applications was for iPhone. Those days are coming to an end. I recently tried an Android app for diabetes management that is not presently sold on iTunes called "Glucose Meter" which is descriptive, although not necessarily catchy. The developer is a Spaniard named Francisco José Belchí (you can follow him on Twitter at @fjbelchi and/or @mGlucoseMeter) who's an Android Developer at a firm called Grapple Mobile in London. The "Glucose Meter" app seems to be his personal project, however, hence the app's website hosted on Google Sites, which offers free web hosting. 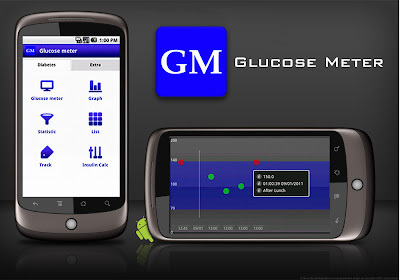 The Glucose Meter app was a finalist in last year's (2010) DiabetesMine Design Challenge among the most creative ideas called "Glucose Meter App for Android". Although there are other diabetes applications available on the Android Marketplace (such as OnTrack Diabetes), I find most of these apps are still pretty labor-intensive, requiring the user to enter all of the data manually, so really it's just putting this data into a phone rather than a computer app. But what makes this app one worth looking into is that at it's core, it enables Bluetooth connectivity for really easy data entry, hence eliminating the one task I despise most about testing: logging. 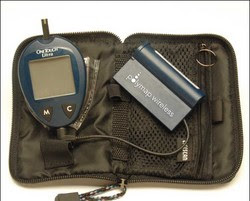 The real key to this working seems to be something made by a Tucson, AZ-based firm called Polymap Wireless which makes a peripheral device called Polytel® Wireless Glucose Meter Accessory (GMA). I'm not certain what this company's primary market for this device is, but I believe it's used in a fair number clinical trials to automate collection of test results from participants. The app (along with the peripheral device) automates the highly-annoying and burdensome function of logging test results by wirelessly transmitting the test results to your mobile phone, and also enables the results to be shared electronically with a doctor by e-mail. One complaint: not all meters that have potential to work with the app have been tested to actually work with it. Presently, only the Johnson & Johnson Lifescan OneTouch Ultra meter family is confirmed to work with it. Still, it does help bring a very widely-used (if slightly antiquated meter that J&J has invested little in to keep it modern) into the 21st century. This was NOT a free application. But the price was a mere $2.75 when I downloaded it (the price is €1.99, so may vary based on current exchange rates), which seemed like a small investment in something which could save me hours of logging down the road. Still, on a 5 point scale, where 1 means "I think the developer needs to go back to the drawing board" and 5 means "I think this application is perfect", I would give this application 3.5 stars, which isn't terrible for the app itself. There are a few reasons I gave it less than 5 stars. First, the app requires the user to have peripheral Polytel® Wireless Glucose Meter Accessory (GMA) device which is inseparable from the app itself. This would be acceptable, except that there are already Bluetooth-enabled meters which would not require a peripheral device, such as WaveSense Jazz Wireless meter (although that meter may still be pending FDA approval if I understand correctly). My bigger point is that although Polymap Wireless also makes Bluetooth add-ons for Bayer Contour meters and Abbott Freestyle meters as well, presently, NONE of these other meters have yet been tested (or have been confirmed to work with) the "Glucose Meter" app for Android, so there's an enormous opportunity there to improve access by expanding compatibility with these meters. 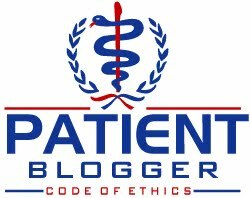 Here in the U.S., "preferred" formulary meter brands at each heathcare insurance company often dictates that a certain brand of meter may be used by a patient (failure to use a "preferred" brand could mean that testing supplies won't be paid for by insurance), and that may (or may NOT) be a J&J/Lifescan/OneTouch meter and test strips. The Polytel® Wireless Glucose Meter Accessory (GMA) Bluetooth device isn't cheap. That costs another $95.00 (and you can now buy some Android phones without a plan contract for roughly that price), and Polymap Wireless does not yet have an e-commerce website enabling people to order the device online. However, with a quick phone call to the company, the receptionist put me in touch with a guy named Pierre Landau, who was able to send me a PayPal link to pay for the device itself, and they did that quickly once I was able to reach him. Mr. Landau told me the company is working on an e-commerce site, but the demand for the devices from individuals is still pretty tiny right now, so it's not a high company priority at the moment. Connecting was anything but self-explanatory; it took me a number of tries to get it right but once it worked, it was great! But the cost of the additional device is an issue, especially when it costs almost as much as some Android phones do. Still, the developer deserves compliments for putting the all of the pieces together. According to the "Glucose Meter" app's website, they have had somewhere around 10,000 downloads to date. But much of the onus is placed on the individual to figure all of this out, as it was not exactly spelled out on the site (and the developer admits that he came to the UK to improve his English-language skills). A listing of requirements and steps required to fulfill these requirements would be a nice addition to the website. Still, if you're like me, the price of the peripheral device was worth it to save me from the annoying transcription required thanks to J&J/OneTouch Ultra's non-standardized data formatting in their own download format. Once the app is uploaded into your Android phone (Note: you must have Android version 2.0 or higher), the data can be shared via Google Health (I'm not 100% comfortable with Google's lack of willingness to keep my medical data private since they are NOT a "covered entity" under HIPPA), but the basic idea is to automate the endlessly annoying tasks that doctors expect routinely from people with diabetes (PWDs). Second, as noted previously, I think the biggest opportunity is for the developer incorporate data from other brands of meters, so I deducted a point for that. Finally, another complaint is that keeping the Bluetooth function open 24/7 on my phone did tend to use my phone's battery up faster than it when I did not have Bluetooth enabled (it's an easy settings change, so I used Bluetooth on an as-needed basis, such as to share a picture or something). In fact, when I checked what was using my battery, the Bluetooth functionality ranked second after the core Android operating system, and surpassing standby for calls. Therefore, I conclude that another app improvement might be better integration with the Android operating system to enable the app turn the Bluetooth functionality ON when it requires it, and then turning it off once it's finished transferring the meter test reading to my phone. I suspect that code could help preserve a phone's battery life for a longer period of time. Having said all of that, the developer has been very responsive to user comments (for example, I noted that I have both an endo AND primary care doctor, yet there was only a single e-mail field in the app for doctor. He has promised this would be addressed in the next app revision, but did provide me with a work-around until that happens). I'd also like to see something other than Google Medical as the data platform of choice, but as I said, the developer has been very responsive to input from users. Overall, "Glucose Meter" is a good start, and does accomplish a big task of automating the logging function in a non-intrusive way, but I'd like to see the suggested improvements I've noted here incorporated in future app updates. If you'd like to download this application from the Android Marketplace, visit: http://goo.gl/oBEjh. If a credit card reader can be directly connected to android then why not make a meter that directly connects. I bet a meter could be made that adopts to several different brands of strips allowing the user to change brands. Steve, technologically-speaking, there is no impediment to doing this, but there are a few reasons why it hasn't happened yet. One is patent laws, but as any patent attorney will attest, there are often ways around patents. The biggest impediment is regulators at the Food and Drug Administration, which have made such open standards almost impossible to attain approvals. has there been any improvements in this area? Really wanting to stream line the process getting readings from my meter to my phone or computer. with Linux options extremely limited seems that android is the better option to work through. looked at the wavesense jazz meter, which could work if insurance covers strips for this unit. The will have to see, but not holding my breath. I haven't seen any, but the developer is accessible via Twitter or email via its website. My guess is that Linux isn't his specialty, but perhaps someone with expertise in that could build a work-around for it. I would suggest reaching out to the developer, Francisco J. Belchí via one of these channels.